"Island chain" redirects here. For the strategy, see Island Chain Strategy. For other uses, see Archipelago (disambiguation). Not to be confused with arpeggio or a cappella. The Aegean Sea with its large number of islands is the origin of the term "Archipelago". The Mergui Archipelago in Myanmar. An archipelago (/ˌɑːrkɪˈpɛləɡoʊ/ ( listen) ARK-ih-PEL-ə-goh), sometimes called an island group or island chain, is a chain, cluster or collection of islands, or sometimes a sea containing a small number of scattered islands. Indonesia, Japan, the Philippines, New Zealand, Maldives, the British Isles, the Bahamas, the Aegean Islands (Greece), the Florida Keys, Hawaii, Puerto Rico, the Canary Islands, the Madeira and the Azores are all examples of well-known archipelagos. The word archipelago is derived from the Ancient Greek ἄρχι- (arkhi-, "chief") and πέλαγος (pélagos, "sea") through the Italian arcipelago. In Italian, possibly following a tradition of antiquity, "Archipelago" (from medieval Greek *ἀρχιπέλαγος and Latin archipelagus) was the proper name for the Aegean Sea and, later, usage shifted to refer to the Aegean Islands (since the sea is remarkable for its large number of islands). Archipelagos may be found isolated in large amounts of water or neighbouring a large land mass. 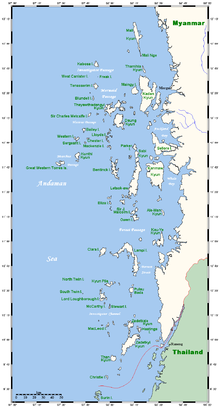 For example, Scotland has more than 700 islands surrounding its mainland which form an archipelago. Archipelagos are often volcanic, forming along island arcs generated by subduction zones or hotspots, but may also be the result of erosion, deposition, and land elevation. Depending on their geological origin, islands forming archipelagos can be referred to as oceanic islands, continental fragments, and continental islands. Oceanic islands are mainly of volcanic origin, and widely separated from any adjacent continent. The Hawai'ian Islands and Easter Island in the Pacific, and Île Amsterdam in the south Indian Ocean are examples. Continental fragments correspond to land masses that have separated from a continental mass due to tectonic displacement. The Farallon Islands off the coast of California are an example. Sets of islands formed close to the coast of a continent are considered continental archipelagos when they form part of the same continental shelf, when those islands are above-water extensions of the shelf. The islands of the Inland passage off the coast of British Columbia are an example. The largest archipelagic state in the world by area, and by population, is Indonesia. ^ Indonesia. The World Factbook. Washington, DC: Central Intelligence Agency of the United States. 4 December 2008. Archived from the original on 10 December 2008. Retrieved 7 December 2008. Chisholm, Hugh, ed. (1911). "Archipelago" . Encyclopædia Britannica (11th ed.). Cambridge University Press. This page is based on the Wikipedia article Archipelago; it is used under the Creative Commons Attribution-ShareAlike 3.0 Unported License (CC-BY-SA). You may redistribute it, verbatim or modified, providing that you comply with the terms of the CC-BY-SA.